A Christmas Carol, perhaps the best-loved tale of Charles Dickens told and retold in endless fashion on the golden screen and in storybook adaptations based on the same theme throughout the years. My favorite version is the cartoon ,“Mr. Magoo’s Christmas Carol”, a sweet, delightful musical adaptation that premiered in 1962. That one really touched my heart as a kid, especially the scene where the young boy Scrooge is singing the haunting, “All alone in the World.” Isn’t that the story’s essential theme? Ebenezer Scrooge, left all alone as a child and building a wall of materiality all around him over the years to fill in that terrible void? Yet his material-sanction reaches a climax in old age as three spirits (plus the marvelous Ghost of Jacob Marley—I played that role in the musical version, Scrooge, as a young teen back in 1972) arrive one frigid Christmas Eve—symbolic of how his heart had frozen-over in all those years—and the subsequent visitations with all those Christmas memories circling-about in Scrooge’s sub-consciousness melting the frozen lake of his hidden tears as his humanity is revisited and regained, as symbolized by the disabled boy (metaphor for Scrooges’ hidden and broken inner-child) Tiny Tim. Tiny Tim’s life was salvaged and resurrected that new and bright Christmas morning and so was Scrooge’s forlorn and forsaken spirit. 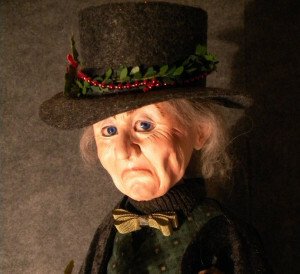 Have you ever wondered, though, whatever became of Scrooge’s spirit after that one gloriously splendid Christmas morn? Well, certainly it had broken free from its own self-made prison; but did it remain free? After all, doesn’t the end of the story circumambulate around all those wonderful-material Christmas Treasures? An image that has certainly become hard-wired within the collective popular psyche—without celebrating a “material” Christmas is absolutely no-Christmas! What, a Christmas without its materially-based savior? Bah! Humbug! Isn’t materiality the absolute savior after-all? NO! Ol’ Ebenezer’s spirit did not remain free; it only became heavier-weighted down with all those excessive material chains. True, that excessive material-spirit will continue to be haunted Christmas after Christmas with each separate material possession that just builds and builds into a piranhaic feeding frenzy that begins right after Halloween. There are more incidents of severe depression and suicides during the much ado about nothing Holiday Season (as if people can only become cheerful and giving during a two-month stint); during my ministry as a hospital chaplain back in the 1990’s I witnessed more heart-attack victims as well as sufferers of severe fatigue being rolled into the ER with frightful regularity in the month of December. The season of cheer has unfortunately become a season of darkness, ridden with perpetual-stress, one that really takes its toll on the naive consumer-culture. What to make out of all this maddening-mayhem? This entry was posted in Spirituality, Uncategorized and tagged A Christmas Carol, Charles Dickens, Christmas, Ebenezer Scrooge, ER, Translucent Light. Bookmark the permalink. The proof of this is a child may enjoy a cardboard box than the wonderful toy that came in it. If anyone thinks this season is one of selfless giving should see the slamming brutality of commercial exploitation and the sense of obligation to acquire more. People acquire things to impress and win over others, only to realize once they have all of the material status symbols, the people they sought to impress now hate them for it. In my child’s Christmas stocking I put an orange or two along with the nicer gifts as a reminder that joy arises naturally with right cultivation, and no price may equal the resplendent gifts of nature.